Every Doctor deserves a monster perfectly engineered to target their greatest weakness. 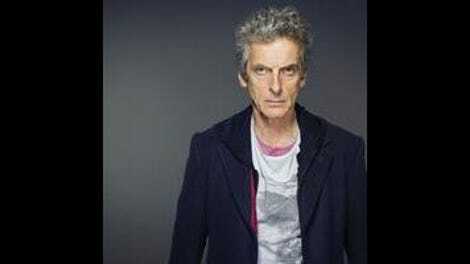 For Peter Capaldi’s incarnation, what could be deadlier than robots that kill people for not smiling? While this Doctor has cast off the enforced dourness that defined his first year in the role, he’s not the naturally grinning maniac that his three immediate predecessors were, which makes for a lot of fantastic face-based physical comedy whenever the Doctor and Bill need to fool the Vardi. Beyond that, I struggle to say too much in favor of the episode’s central threat, as it’s the textbook example of an intriguing setup for an episode that loses much of its luster once all is explained. That’s not unusual for Doctor Who, where the explanations frequently rely on technobabble and other assorted gibberish. But I’m getting ahead of myself, as the episode’s tepid conclusion shouldn’t overshadow the half-hour of the Doctor and Bill just exploring, getting to know both the world in front of them and each other. Experimental storytelling on Doctor Who isn’t unique to Capaldi’s time in the TARDIS—indeed, the structure of “Smile” recalls “The Girl Who Waited,” which put a similar focus on the main characters—but tonight’s episode and “Heaven Sent” are perhaps the best examples of Doctor Who trusting just its two main actors to carry an entire story. 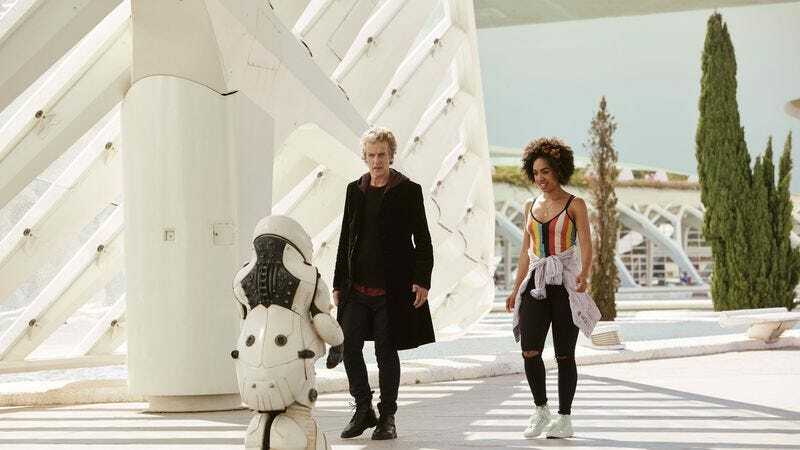 Capaldi and Pearl Mackie prove more than up to the challenge, and credit here must also go to writer Frank Cottrell-Boyce, who acquits himself far better here than in the season eight misfire “In The Forest Of The Night.” The opening scene in the TARDIS (which, if past precedent for such scene is any indication, might have been written by Steven Moffat) sets the tone for the rest of the episode, as Bill simultaneously embraces the magic of the TARDIS and wonders about the practicalities of it all. What, after all, is the point of seats that are so far away from the controls? There’s also an intriguing edge to their banter about stealing the TARDIS, as the Doctor responds to Bill’s admission she wouldn’t know how to fly it by pointing out he didn’t either when he started out. None of that reads as foreshadowing or anything so concrete, but it once more feels different from how past Doctors and past companions have interacted. Bill also displays such infectious, unabashed joy at the future she discovers. Much like when she resisted the mindwipe in “The Pilot,” she shows some sci-fi knowledge with her exacting standards as to what makes a good robot. She approves of a future based on eating algae but objects to the apparent food sexism of the Doctor’s double portion, although in both instances the Doctor’s still broader perspective (or heart surplus) complicates the picture. The episode hits an intelligent balance here, sketching out Bill as a multidimensional character while still acknowledging that entering the Doctor’s bizarre universe can alter a person’s expectations. Bill also shows her perceptive side tonight, even if it does take her longer than she would like to admit to realize there was no need for her to hover by the map. The Doctor warns Bill against sentimentalizing him, but her taking the words outside the TARDIS literally reads more like an effort to understand her new friend as anything else. Well, I say “friend”: She does call him the best tutor ever, a continuation of their relationship in “The Pilot” and a subtype of Doctor-companion interaction with an excellent history across the show’s decades of existence. “Smile” elects to downplay her initial curiosity over whether the future will prove happy—it implicitly feeds into how excited she is about seeing the city, but the episode doesn’t really circle back to it when she discovers the cataclysm that has befallen humanity. This is tricky to judge. Looking at past seasons, particularly Capaldi’s first year in the TARDIS, Doctor Who has shown that it frequently struggles to make overt points about character with getting didactic. On the other hand, Bill’s characterization is still forming, so “Smile” may have missed a beat in not tying her reactions to the future—the hope of a happy tomorrow, her near desperation to get the Doctor to admit he loves the city, and the tearful realization of the dreadful truth—to something more specific about her character. No matter, it’s still early days, and perhaps it will prove wise to leave such things in the subtext. Already Bill feels more clearly drawn than Clara did for a worryingly long chunk of her tenure, perhaps simply because she is there to be a character, not a mystery. The second episode of a new TARDIS pairing is a time for the show to be finding its bearings once more, and if “Smile” is judged primarily on its main characters and their potential going forward, it’s in excellent shape indeed. As a story in its own right, well… this is the early-season, far-future episode for a new TARDIS team. In that regard, it follows “The End Of The World,” “New Earth,” “Gridlock,” “Planet Of The Ood,” “The Beast Below,” and “Into The Dalek.” There are some good episodes in that bunch—“Planet Of The Ood” is legitimately great—and a few underrated efforts, but there’s a general pattern there of undercooked narratives that favor characterization over airtight plotting. That’s not such a bad thing for a story whose function is to establish the new iteration of the show’s central characters, but it can only excuse so much the flimsiness of this episode’s premise. The trouble is that, like the magic haddock the Doctor keeps mentioning, the Vardi aren’t meant to be good or evil, just different in their thinking from the humans. But “they think differently” isn’t a terribly compelling explanation for an entity that can’t speak for itself—without some sense of the underlying logic, it’s hard to buy into the story on a deeper level. Having watched “Smile” twice, the best I can understand is that the Vardi think of humanity as a single overall entity, so killing a single grief-stricken human is a bit like deleting a corrupted file from a computer without understanding said deletion is what causes the virus of sadness to spread. Perhaps this is where the great strength of “Smile”—the two-hander structure that lets the Doctor and Bill dominate the proceedings for well over half the running time—becomes a weakness. In its closing section, the Doctor sure appears to be indicting humanity for its mistreatment of the Vardi, calling them a slave race and saying the robots are now the de facto owners of the planet, not because they have any special right to be there but because they have absolute power over the situation. That sure reads like the setup for the kind of totalitarian setup the Doctor would want to take down, but if anything he takes it upon himself to negotiate a settlement more favorable for the Vardi. If we knew more of the backstory of the Vardi, or if we knew characters like Ralf Little’s Steadfast for more than 10 minutes, perhaps the Doctor’s stance could make sense, but as is it at best the resolution feels fatally rushed. Now, I’m probably overthinking this, as that’s part of what being a Doctor Who fan is all about. It’s far easier to read the ending as just the writers missing the mark on a standard, equitable for all conclusion than it is some radical revision of the Doctor’s morality (although both this and “In The Forest Of The Night” suggest Cottrell-Boyce does have a somewhat different, more alien take on the Doctor’s worldview than most writers, for better or worse). The final 15 minutes or so of “Smile” recall previous, more or less average sci-fi efforts like, say, “The Doctor’s Daughter,” except the extreme narrative compression of introducing all the relevant humans with so little time left means what could have been a serviceable ending just reads as nonsensical. The result is an episode that begins better than it ends, which is never the optimal arrangement. But ah well: The Doctor and Bill’s growing friendship and Bill’s character in particular are the real joys of “Smile,” and they are likely what will linger in the memory more when looking back on the season as a whole. It’s not said absolutely explicitly, but the episode does appear to be set around the same time of the solar flares that also precipitated the events of the 4th Doctor adventure “The Ark In Space” and the 11th Doctor entry “The Beast Below.” The former link is especially appropriate, given that story like “Smile” took its sweet time in having the Doctor and his companions encounter anyone else. The mystery of the vault is coming along nicely, with some intriguing tension between the Doctor and Nardole and talk of an oath. Again, this feels different from any other season-spanning mystery the show has done, so I remain very much on board for this. Mira Anwar gets almost nothing to do as Goodthing, but she was previously a recurring character on The Sarah Jane Adventures, which may make her the first person with such a status on one of the spin-offs to make her way back to the main show as a new character. Unless you’re counting Peter Capaldi’s turn as John Frobisher in Torchwood: Children Of Earth as a recurring character, I guess. Hey, I got through this entire review without using the word “emoji.” I feel good about this.